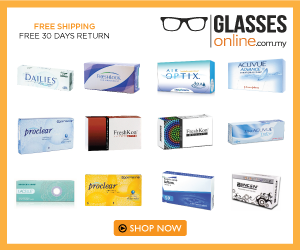 Keryi.Can.Boleh: Get Your Fashionable Eyewear with GlassesOnline. that I barely have time for myself. as oppose to lazing around and watching TV all day long. and I noticed that small details do transform a look. Sunglasses now come in all shapes and sizes. from the increasingly strong UV rays. Have problems finding the perfect sunglasses??? I am telling you they have EVERYTHING there. They even have a cute info-graphic to help us get the perfect sunglasses! Spectacles are no longer just an object to help us see better. So, what is your must have choice? Being a fashion junky, it is difficult to choose between the two. sunglasses, spectacles or contact lens! that is both stylish and affordable! Get yourself or a love one something nice and useful today!